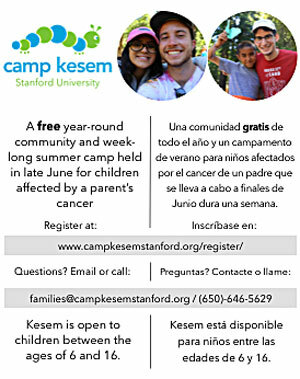 East Palo Alto Today's internship program. Click above image or go to https://smile.amazon.com/ch/20-1415500 to support East Palo Alto Today with your purchases. Click above photo to enlarge. 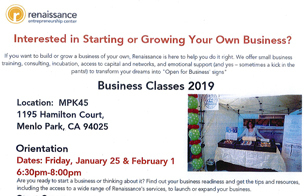 For more information call 650-321-2193. Pacific Islanders make up almost 10% of the community and have immigration issues that are similar to those of many other immigrants in our local communitiesm....Read more here. Markers and blank name tags sit on the tables inside the Lewis and Joan Platt East Palo Alto Family YMCA’s community room....Read more here. Politicizing the 2020 Census: Should the U.S. Citizenship Question be added? Is this person a citizen of the United States? It’s a simple enough question. But, it’s a controversial question that the Trump administration would like to put in the 2020 Census....Click here to read more. On Sunday, January 20, 2019, the East Palo Alto community lost one of its longtime, influential residents, Mrs. Gertrude Dyer-Wilks. The announcement of Mrs. Wilks' death was made by her granddaughter, LaPria Wilks, who issued the following statement.... Read more by clicking here. In a 3-day Silicon Valley summit this month, change makers, investment experts, entrepreneurs and thought leaders will highlight the role of the African diaspora to aid in amplifying the continent’s growth and abundance in key sectors in 2019.... Read more by clicking here. Did you get your flu shot? If not, it’s not too late and according to the Center for Disease Control(CDC) its critical that you do so. In fact, CDC officials are urging flu shots for everyone over 6 months....Read more by clicking here. As the Census Bureau prepares for its 2020 count, concerns about new plans to question respondents about their citizenship status have taken center stage...Read more by clicking here. Write one food off of your Thanksgiving menu. The Centers for Disease Control and Prevention has issued a food safety alert advising U.S. consumers to throw away, without eating, all of their romaine lettuce....Read more by clicking here. EGift cards -- prepaid credit-card-like financial instruments -- are for gifts. Just ask the government....Read more by clicking here. East Palo Alto police officials announced over the weekend that two people were shot to death and two others were seriously wounded on Sunday, October 14, 2018. The shooting took place at approximately 2:44 a.m. in the 2500 block of Pulgas Avenue. Read more here. Is there anyone, whom you’d like to see on the November 6, 2018 ballot, who hasn't filed to run? If there is someone you’d like to see as a candidate, who now isn’t, let them know that, as of September 10, 2018, they can file as a write-in candidate....Read more here. 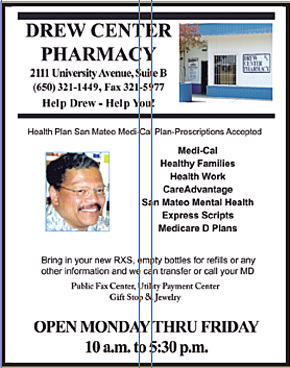 Carlos Martinez, East Palo Alto’s current city manager is slated to leave his position with the city to become the city manager of Richmond, CA, starting on November 1, 2018....Read more here. The U.S. Census Bureau is seeking public comments on its 2020 Census plan, which includes a citizenship question on the census form all households must answer....Read more here. If you and/or someone you know are interested in running for office in the election this November, now is the best time and the only time to file as a candidate....Read more here. Do you know of any agencies that get federal recognition for their environmental programs and, at the same time, offer programs that celebrate cultural diversity?....Read more here. It might feel more comfortable to work with people who are – more or less – just like you, but study after study has shown that’s not the best way to do business....Read more here. 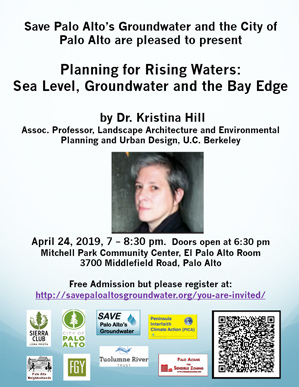 East Palo Alto voters will face some big changes in the upcoming June 5 election....Read more here. For the past 33 years, JobTrain has held an annual breakfast to recognize one individual and one organization from the East Palo Alto community for making a positive impact in the community....Read more here. The best response to White House efforts to disenfranchise ethnic communities is for them to stand up and be counted in the upcoming 2020 census, a wide spectrum of experts and civil rights advocates agrees...Read more here. 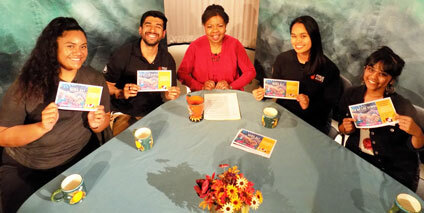 From left, Alamoni Afungia, Edgar Tenorio, Henrietta J. Burroughs, Lea Bolosan and Srishti Prabha are shown on the set of the Talking with Henrietta television show after the taping of their show discussion on April 11, 2019. See more about the show below. Do youth leadership training programs live up to their goal of training leaders? Four future leaders discuss this topic on this edition of Talking with Henrietta. 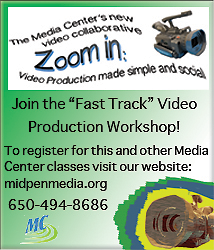 Get more information about this show by clicking here. Improving Dental Care in the U.S.
From left, Diana Deras Mangaña, Corali Tejada, Henrietta J. Burroughs, Joana Pa’aga and Dr. Yogita Thakur are shown on the set of the Talking with Henrietta television show after the taping of their show discussion on March 28, 2019. See a brief description of the show below. Did you know that dental care in the U.S. is in a sorry state? You will understand why when you see this edition of Talking with Henrietta. Click here to get more information about this show. From left, Cephus Johnson, also known as Uncle Bobby X, Beatrice X. Johnson, Henrietta J. Burroughs and Minister Keith Muhammad are shown on the set of the Talking with Henrietta television show after the taping of their show discussion on March 14, 2019. See more details about this show below. You’ve probably heard about Oscar Grant and his murder on a BART train station platform in 2009. On this edition of Talking with Henrietta, we discuss the impact that his death has had on our criminal justice system. See more about this show by clicking here. From left, Twum Djin, Henrietta J. Burroughs, and Almaz Negash sit on the set of the Talking with Henrietta television show after the taping of their show discussion on February 28, 2019. See more details about this show below. What Ideas do you hold about Africa and those who come from Africa? Are your ideas up-to-date? Find out on this edition of Talking with Henrietta if the ideas you have coincide with reality. Go here to get more details about this show. 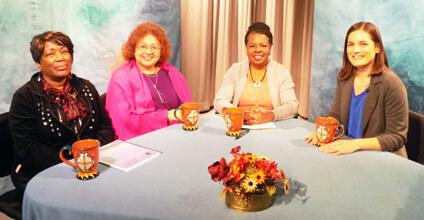 From left, Viera Whye, Henrietta J. Burroughs and Khalilah Ramirez sit on the set of the Talking with Henrietta television show after the taping of their show discussion on February 14, 2019. See a brief description of the show below. February is recognized in the U.S. as Black History Month. Why do we celebrate the month and what meaning does it have? Find out on this edition of Talking with Henrietta. Click here to get more information about this show. From left, Dennis Parker, Len Materman, Henrietta J. Burroughs and Gary Kremen sit on the set of the Talking with Henrietta television show after their discussion on January 25, 2019. See more information about this show below. In 2018, back to back storms hit the Bay Area in November and December and brought heavy rains, winds and flooding. On this edition of Talking with Henrietta, the show's participants discuss our area's prospects for this year. Find out more about this show here. Top Stories of 2018 - What Did the Year Leave Behind? From left, Sue Dremann, Henrietta J. Burroughs, Gennady Sheyner and Jocelyn Dong are shown on the set of the Talking with Henrietta television show after their discussion on January 10, 2019. For more information on this show, see below. What were the top local and national news stories in 2018 and how are they affecting us? We answer these questions on this edition of Talking with Henrietta. Click here for more information about this show. 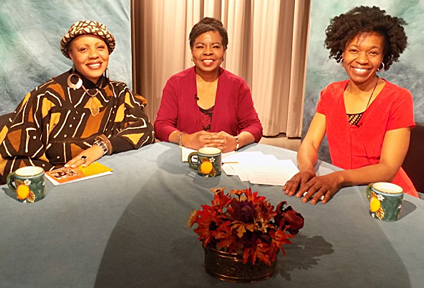 From left, Dr. Mary Bains, Sharla Kibel, Henrietta J. Burroughs and Lucia Hollowell sit on the set of the Talking with Henrietta television show after the taping of their discussion on December 20, 2018. See more details about this show below. Do you view the holiday season as a time of joy or as a time to dread? On this edition of Talking with Henrietta, we discuss some of the reasons, you might do both. Find out more by clicking here. Receive EPA Today Updates in your email. See recent EPA Today Updates by clicking here. 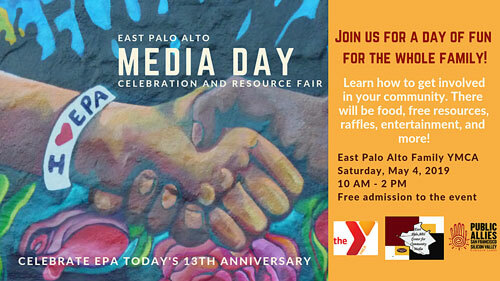 Become a partner of the East Palo Alto Center for Comunity Media, which publishes East Palo Alto Today. See how here. 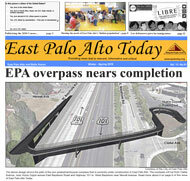 Be an East Palo Alto Today subscriber. 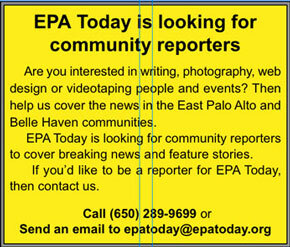 Get a personal two-year subscription to East Palo Alto Today.